Gate Precast designed, produced and erected numerous massive insulated, brick inlay architectural precast panels with a Gatestone finish for the new six-story Cook Children’s Medical Center’s South Tower Expansion in Ft. Worth. Gate Precast’s collaborative design-assist program was instrumental in helping our team achieve the milestone schedule and budget goals for the exterior skin. Sean Patrick Nohelty, AIA, with David M. Schwarz Architects of Washington, D.C.
Gate Precast’s proficiency in design-assist recently helped the project team on a major hospital tower expansion to expedite design documents and keep the project on track. To be completed in 2016, the new 314,000-square-foot, six-story Cook Children’s Medical Center South Tower Expansion required 667 panels for 76,000 square feet of precast cladding. Panels range from 1,000 to 55,000 pounds, with the larger panels reaching 14 feet wide by 47 feet long. Gate was heavily involved in precast design, joining the team in a design-assist capacity when design documents were at 50 percent. 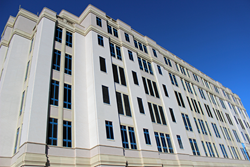 “The architect’s intent was to match the existing look of the hospital campus and achieve the look of natural limestone with concrete precast panels,” said Norm Presello, Gate’s project manager. Since thermal efficiency of the exterior skin is important to the owner, Gate provided a highly rated thermal panel system with two layers of concrete separated by a 3” layer of continuous insulation. To accommodate a severely limited site in the heart of Fort Worth’s hospital district, Gate developed a plan utilizing three cranes to minimize disruption to the site and surrounding hospital traffic. Contractor Linbeck Construction of Fort Worth required that Gate work double shifts to accelerate the schedule. “We were able to accomplish this due to the ability of our Hillsboro, Texas, plant to ensure enough product was available,” Presello said. For nearly 100 years, Cook Children’s has worked to improve the health of children from across its primary service area of Denton, Hood, Johnson, Parker, Tarrant and Wise counties. The hospital combines the art of caring with leading technology and extraordinary collaboration to provide exceptional care for every child. This has earned Cook Children's a strong, far-reaching reputation with patients traveling from around the country and the globe to receive life-saving pediatric care.